This video takes you behind the scenes as the Cumbres & Toltec Scenic Railroad opens a blockaded railroad, and then we charter a special freight train just for YOU! Our presentation takes up where the Rotary train left off. We were invited along on a special work train dispatched to clear a boulder that sits squarely on the tracks. A crew has blasted the rock with dynamite then the work train with its loader is used to clear the rubble off the tracks so repairs can be made. This is very unusual, and in remote Colorado high country. Next we charter a special, authentically lettered "Rio Grande" freight train, just for YOU! We start out of Chama, New Mexico with K-37 2-8-2 #497 in the lead with good size freight train headed for the summit of Cumbres Pass. Engine 484 is a rear helper coupled in just ahead of the caboose, as they tackle the 4% grade which includes a stop for both engines to water at the Cresco tank. As elevation increases to about 9500 feet, the snow deepens from where the Rotary had cleared a few days earlier, and the freight crests 10,015 foot Cumbres Pass in a 6 foot trench of snow. Later our train encounters a huge drift of snow near Osier, and our helper engine, now running ahead of the train, plows the snow several times, and derails. 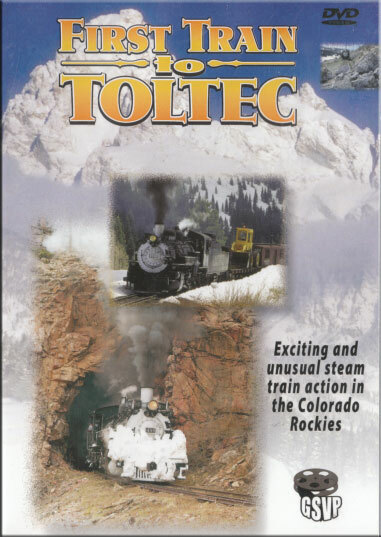 After re-railing we head east to videotape a snow-covered locomotive at several locations, including the Toltec Tunnel. We are the first train of the 1997 season to reach this location, a remote spot in the Rockies on the narrow gauge with a steam-hauled freight train. A great companion to our Rocky Mountain Snowplow video. Steamboy (Revere MA US) on 2016-07-26 19:44:53. This Follow-up Video from Both Notable "America By Rail" Filmakers, Greg Scholl & Les Jarrett, Shows the rare aftermath from the snowplow video itself. Converted on DVD in 2006, Greg added a bonus segment of work on the rockslide, this time from inside the cab of engine 497. Sadly Though, there are No Previews at the end.